Almost exactly a year ago Tropical Cyclone Debbie crossed over our house in the northern Whitsunday region. This huge category 4 storm was moving at a walking pace and we had destructive winds for about 24 hours. These winds destroyed our house, which has now been repaired and is stronger than before, but they also destroyed our local reefs. 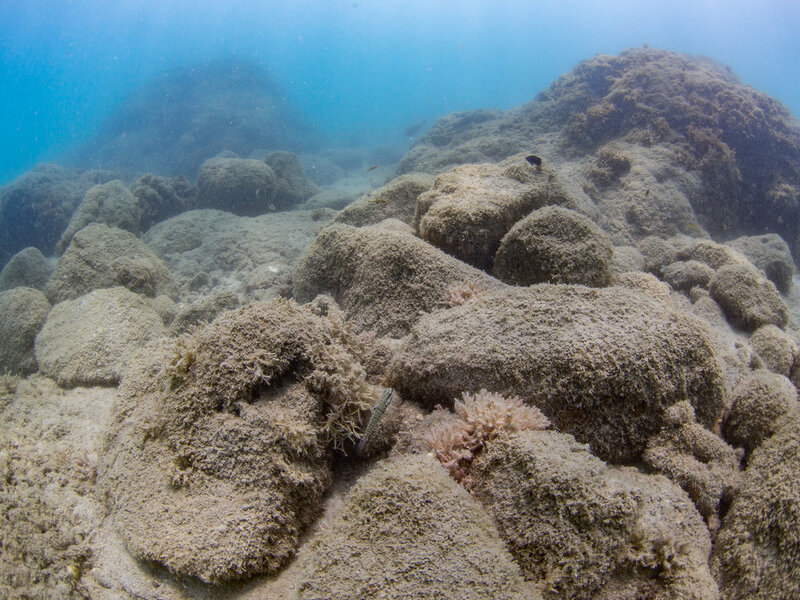 Our favourite shallow fringing reefs around nearby islands have been completely devastated. Most of the more fragile Acropora and Montipora coral has been torn off, broken up and deposited in a huge rubble bank on the reef flat. Larger corals have been damaged and partially broken. Huge boulder corals, some of them over eight metres across, have been dislodged and turned on their side. The power of the waves kicked up by the 300+ km/hr wind gusts packed by this cyclone was almost unbelievable. It will take many years for the reefs to recover. On some reefs fast growing algae has seized the opportunity to grow and cover the bare bottom and this will probably slow down recovery. Although some corals have survived, especially in the deeper parts of the reef, all have suffered damage to varying degrees. We have before and after photographs of many of these reefs and I will post some here to show the scale of the reef devastation. Before the cyclone this huge Porites coral at Rattray Island, 10m across and 5m high, was upright and healthy. 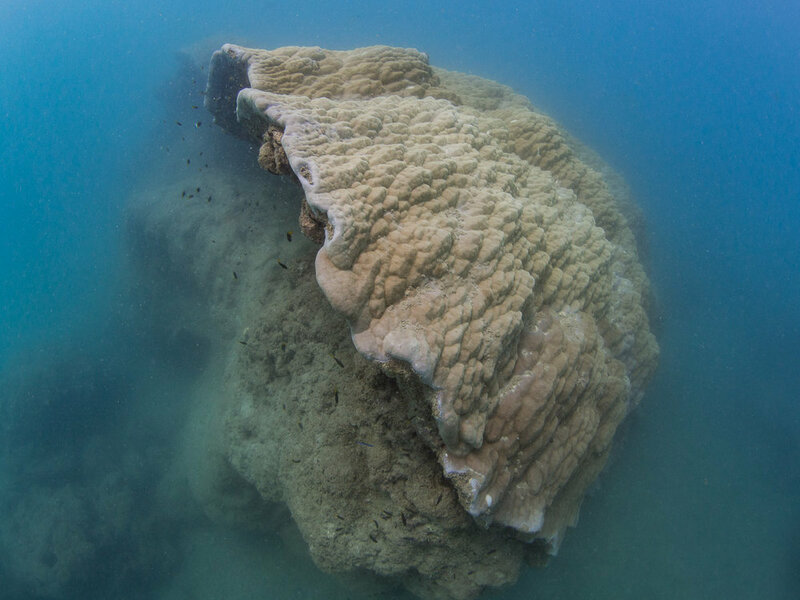 The same huge Porites coral has been turned on its side by the cyclone. Before the cyclone lush coral gardens covered the bottom at Rattray Island. After the cyclone very little coral remained where the gardens had been. Healthy Montipora corals on Rattray Island before the cyclone. Damaged and toppled Porites in a barren landscape. On Saddleback Island before the cyclone healthy corals covered the reef flat. Closeup of the rich coral on Saddleback Island before the cyclone. After the cyclone the rich coral on Saddleback had been heaped in a metre high dead rubble bank. Paddling over the rich Saddleback reef before Cyclone Debbie. After the cyclone almost nothing is left alive. Before the cyclone Gumbrell Island had an amazing coral garden. After the cyclone the shallow reef slope at Gumbrell had been turned into a rubble bank. 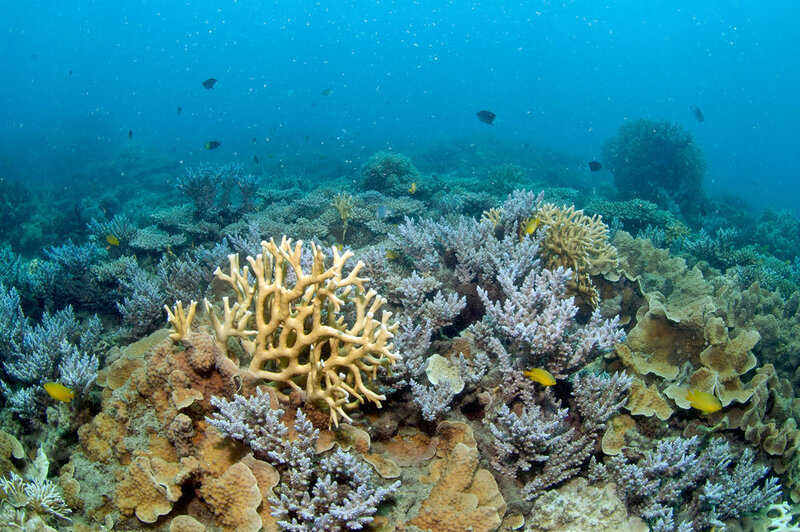 Before Debbie extensive stands of Montipora corals covered the shallow reef slope at Gumbrell. After Debbie most of the shallow reef had been stripped bare. Dense forest of algae (seaweed) growing on the bare reef slope after the cyclone. The Gumbrell Island reef slope had dense staghorn coral thickets before the cyclone. After the cyclone most of the staghorn coral had been broken and thrown up in a huge rubble bank.